An elegant addition to your next feast. 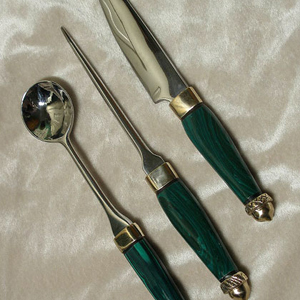 This set contains knife spoon and pick, it was custom designed using acorns for the ends and malachite for the handles. A similar set can be customized for the person. Size and type of utensils, handle material and end pommel can all be done to suit the customer. Acorn Dining Set is not available for sale. This is an example of custom, limited-edition design. Once in a while I try to do something a little different. I created this small knife for fun. A very nice antler handle with a smooth elegant blade flowing and blending together. It sits very comfortably in the hand. 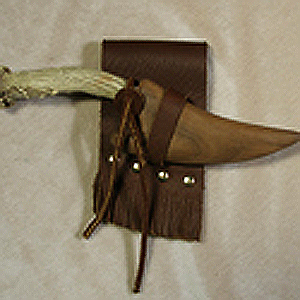 The sheath is made from walnut with a beeswax finish. Sheath and knife slide into hanger. Set up for right hand but could remake for left. Total length 7.5", blade 3.5"
Antler Knife is not available for sale. This is an example of custom, limited-edition design. Antler Knife (Swept Blade) is not available for sale. This is an example of custom, limited-edition design. Bitten Knives is not available for sale. This is an example of custom, limited-edition design. Black Iron sickle is not available for sale. This is an example of custom, limited-edition design. Our client gave us a list of images and ideas that were important to their group. Trees and the forest played a big part, Bur oak, cedar, pine, antlers etc. We worked through several concepts adding some combining. The final result is stunning! The knife is small but solid. The balance is excellent and it moves easily. All sittings are cast and polished bronze. The handle is recycled ebony. Genstone is garnet. Boreal Heart Athame is not available for sale. This is an example of custom, limited-edition design. A true work of art. A client came to us with a concept for her magical knife. She described her philosophy and ideas, how she felt and what the knife needed to represent. She also gave us a list of elements important to her. Here is the result. The overall knife is bronze with silver plate, the handle is black onyx shot with gold. The blade is tempered steel in a leaf shape. The concept of the microcosm and the macrocosm is represented. The galaxy and planets spiraling into the ripples of a pond, the movement of the earth and of the seas. Gemstones include are, Amber, ruby,Sapphire, citrine, peridot, hematite and lapis. The plants and animals represented are the Orca, Turtle, frog, badger, bird, fish and marshmallow. Celestial Athame is not available for sale. This is an example of custom, limited-edition design. 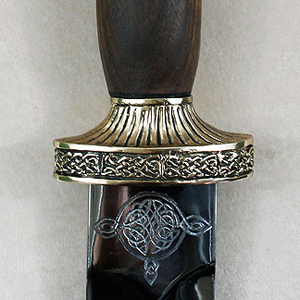 A solid bronze sickle with Celtic knot work on both sides of the blade. This one has been customized with a special handle sent from the client, a special piece of cut travertine stone, which we fitted to the bronze blade. total length is 11.75"
Celtic Sickle Custom is not available for sale. This is an example of custom, limited-edition design. Uniqued designs created to a clients specifications. 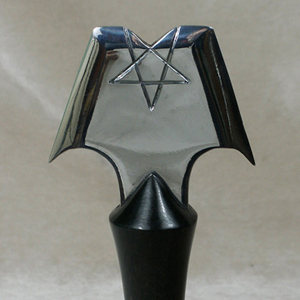 We started with some simple versions of our hilts then added the hexagram pommel. The overall hilt was then painted to a solid bright uniform color. Engraving and gold added afterwards. Colored Athames is not available for sale. This is an example of custom, limited-edition design. A custom Tool created to a clients specifications. 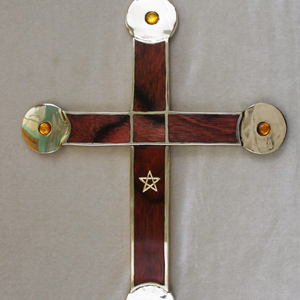 A cross cast in bronze with inlays of Dymondwood. Amber gemstones are on both sides on all four arms. Sigils and hebrew are engraved on each side of the 4 arms. Lower arm of cross comes off to reveal a small 5" blade. Total length 13"
Cruciform Knife is not available for sale. This is an example of custom, limited-edition design. A small and useful knife requested by a client. Total length is only 6". The handle is oak with a fern carved in relief on either side. Handle has a tung oil coating. Garden Knife is not available for sale. This is an example of custom, limited-edition design. A custom order we created for a client. The Golden Dagger of Ur. The Golden Dagger of Ur is one of the great treasures discovered of ancient Mesopotamia. It was excavated by Leonard Woolley in 1927 and dates to around 2400BC. We hand sculpted our replica and cast it in bronze with a plating of gold. The handle is a Lapis Lazuli composite with 48 handmade bronze studs gold plated in top. We tried to follow the original as much as possible in size and shape. The result is a truly stunning work of art. Golden Dagger of Ur is not available for sale. This is an example of custom, limited-edition design. A small custom knife created for a client. Based on an artist rendering. The knife is 8" long with a white horn handle and latin text engraved on the handle on both sides. 3 brass nails are along the top of the handle. Healers Knife is not available for sale. This is an example of custom, limited-edition design. Holly Oak Knife is not available for sale. This is an example of custom, limited-edition design. Set of knives created for the TV series "Killjoys"
Killjoy Knives is not available for sale. This is an example of custom, limited-edition design. A custom designed work using separate hilts and pommel. We took the hilt from our crescent knife with the sun pommel from our Pegasus knife. 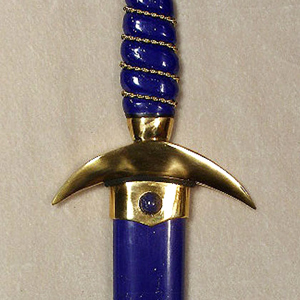 The handle is stabilized lapis lazuli as well as the entire sheath. Dagger and sheath fittings are gold plated with lapis gems inset. Lapis Sun Dagger is not available for sale. This is an example of custom, limited-edition design. A custom Athame we created for a customer. A clean simple hilt based on our Saxon dagger and a pentacle pommel. The handle is ebony with an inlay and needed to be extra large for the customers hands. The blade is 9" long and a little wider. 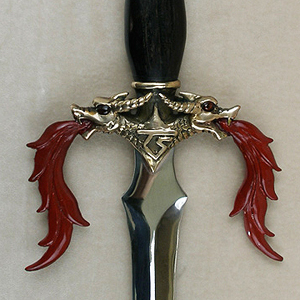 Large Athame (Custom) is not available for sale. This is an example of custom, limited-edition design. A very large bronze Sickle made to the clients request. Plain ebony handle with simple ball pommel. Paganism is recognized as a legitimate religion by the US Military. We worked together with a group in the US Air Force to create this unique Knife and Boline set. The set was purchased by the Military for their use. The handles are ebony with garnet and green onyx gemstones. Military Athame Set is not available for sale. This is an example of custom, limited-edition design. 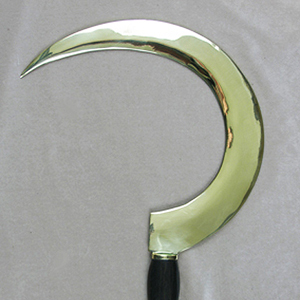 A custom made sickle. We created a solid bronze blade used with our Moon and Star crosspiece, round moss agate spheres are mounted in either crescent. The handle is made from holly wood and is extra large for the customers hand. The pommel is specially shaped and has 2 amber gems. 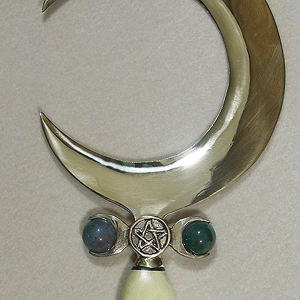 Moon and Star Bronze Sickle is not available for sale. This is an example of custom, limited-edition design. Designed by the client. Incorporating multiple symbols of the National Guard/ Military Police. All hand sculpted. 8" blade with engraving. Handle made from purple Caroite. National Guard Knife is not available for sale. This is an example of custom, limited-edition design. Created exclusively for the "Hex" Stores in Salem and New Orleans. This knife has a bronze hilt, pommel and a solid bronze 6.5" blade. Handle is carved bone with bronze wire inlay. Overall length is 12"
Necromancer Knife is not available for sale. This is an example of custom, limited-edition design. "Ritual" versions of the Pesesh Knife were made for the Egyptian Ceremony for "Opening the Mouth". This version of the Pesesh Knife was designed by our client. Steel blade with ebony handle. Bronze base with silver plate. Pesesh Knife is not available for sale. This is an example of custom, limited-edition design. 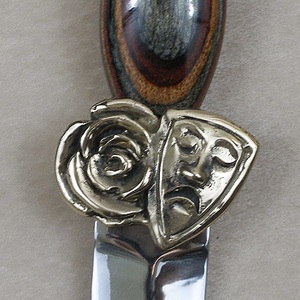 A custom knife created using our rose and including a mask of tragedy. Sized to fit into an arm bracer. Rose and Tragedy is not available for sale. This is an example of custom, limited-edition design. 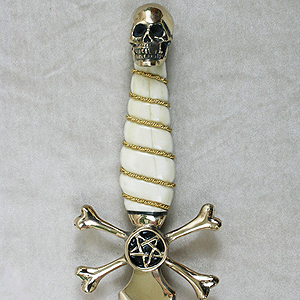 Small Skull Knife is not available for sale. This is an example of custom, limited-edition design. A custom athame created for a client. A Succubus on top holding a gemstone. 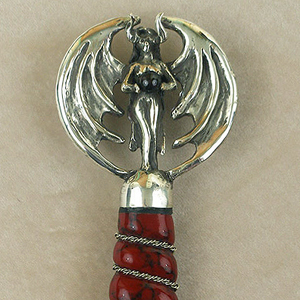 Silver plated fittings and a composite red jasper handle. 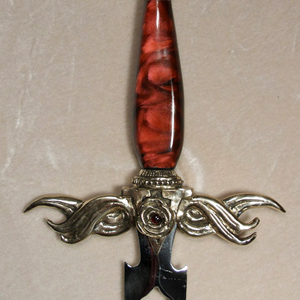 Succubus Athame is not available for sale. This is an example of custom, limited-edition design. We worked with a client to create this special knife for her. Solid bronze blade with a trident sculpted on either side. There is greek engraving across the hilt and the pommel has a stylized water/wave pattern. The handle is made from 3000 year old bog wood with an inlaid disc with another trident engraved there. The knife is not very big, only 11" long total. Trident Knife is not available for sale. This is an example of custom, limited-edition design. An all bronze sickle with a simple oak handle and a raised version of a knot work trickle on the blade. Designed to a clients specifications. Triskele Boline is not available for sale. This is an example of custom, limited-edition design. Originally created for the Winter Carnival Vulcans of St. Paul Minnesota. Flames form the quillons with a large V in the center. A rose is positioned on one side. A flaming torch is the pommel. Vulcan Dagger is not available for sale. This is an example of custom, limited-edition design. 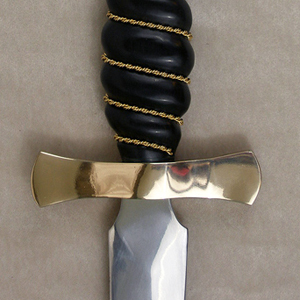 Created for a client based on the Air Dagger for the Golden Dawn. We used bronze and wood to create the handle and painted everything a gloss yellow. Details were left for the client to paint themselves. Yellow Air Knife is not available for sale. This is an example of custom, limited-edition design.